NES BreakThru (USA) in 06:37.13 by dave_dfwm. BreakThru is a short, fast-paced game developed by Data East. It was released to arcades in 1986 and later ported to a few home consoles. 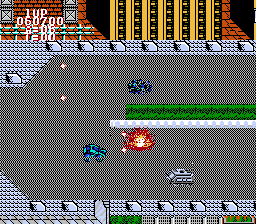 You are the driver of a blue dune buggy, and your mission is to recover a stolen fighter plane, which lies behind 5 enemy lines that you must "break thru". Dave_dfwm strikes fear into the hearts of his enemies by tearing across the landscape and shooting everything in his path.